This game is simply amazing! End of story. 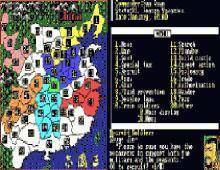 Romance of the Three Kingdoms won the Best Strategy Game Award for 1988, and I can easily understand why. The commands are easy to learn, the strategy aspect is overwhelming, and the game is as addictive as they get. Allthough the game might seem simple, it is far from it. This game started a revolution in the strategy genre, and started a series that has been the flagship for KOEI since its founding in 1988 to this day. Don't get scared by the fact that the screens for this game only comes in three colours, as the game comes with EGA graphic as well. But you will need real DOS in order to see that. Unfortunately I only have DOSBox, and can only get the CGA graphics running. Everything in the game is controlled using numeric commands and enter. As with almost every strategy game by KOEI, you have a lot of different options at your disposal. Everyone who loves good strategy games should try this gem, and especially those who love the newer games in the series or the brilliant Kessen series for Playstation. This is the game that started it all. The game supports multiplayer up to 8 players. Without a doubt, KOEI's flagship Romance of The Three Kingdoms games are some of the best and most original historical strategy games ever made. Based on the classic Chinese epic of the same name, choose to play as one of the warlords vying to unite the far-flung Chinese empire in the 10th century. The first entrant in the RtK series strikes a near-perfect balance between historical flavor and fun, as they feature hundreds of real historical personalities, each with unique traits, and great diplomatic and espionage options. The tactical-level combat is not only fun, but truly reward those who take Sun Tzu's "Ancient Art of War" tome to heart (among the most effective tactics are flanking your enemies from high ground, and luring them into an ambush). One of the game's keys to success is the introduction of intricate personnel management that adds a whole new dimension never before seen in a computer game. Recruiting and rewarding your most capable generals is as important to victory as slaying your opponent's most valued generals in combat (if you can't persuade him to your cause). You can also try to woo your opponents' generals to your side by bribery or personal visits, for which having a high charisma level is all-important. Romance of The Three Kingdoms 1 also boasts numerous other gameplay options that wonderfully capture the culture and society of China at the time: for instance, the number of your population and morale level determines how big an army you can raise, and improved irrigation and donations to the public are prerequesites to high harvest yields and happy townsfolk. You must also contend with natural disasters such as flood, locusts, and plague that can come without warning. Overall, an all-time strategy classics that belong to every strategy gamer's collection.